On Friday 5 October, the Italian research organisations INFN and CNR officially became shareholders of European XFEL GmbH. The National Institute for Nuclear Physics (INFN) and the National Research Council (CNR) together now own 2.9% of the company’s shares; one third going to INFN and two thirds to CNR. 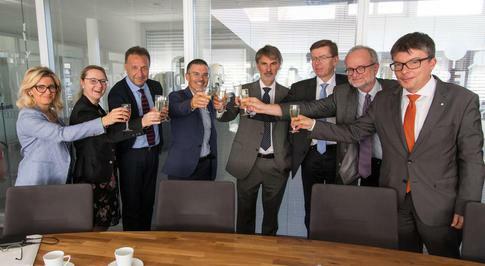 Italy has been a European XFEL partner country since the foundation of the company. With the acquisition of the shares, INFN and CNR – both designated by Italy as Italian shareholders – now also have full voting rights in the company’s supreme organ, the European XFEL Council. The Italian share of 2.9% in the company corresponds to the Italian contributions to the total European XFEL construction and operation budgets, making Italy the fourth largest funders following Germany, Russia, and France. to sign the accession document on behalf of the Italian shareholders. 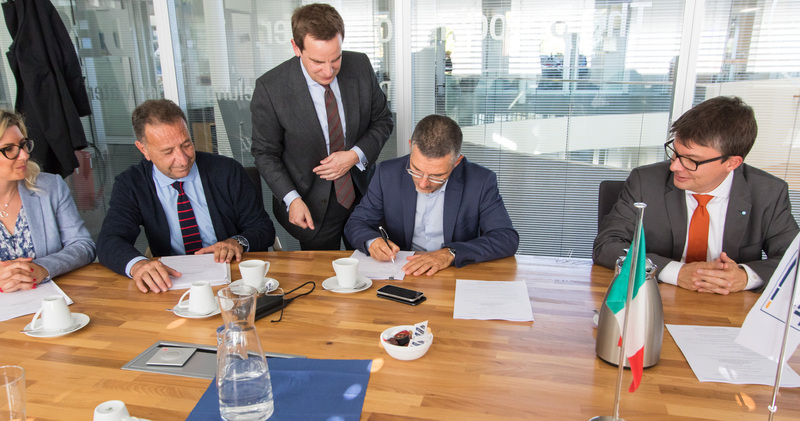 The shares were transferred from European XFEL majority shareholder DESY, whose directors Christian Harringa and Reinhard Brinkmann were also present to sign the document. European XFEL GmbH is a non-profit company. Its shareholders are designated by the governments of the international partners. With the addition of Italy, ten of the twelve partner countries have formalized their commitment to the project by becoming shareholders. INFN conducts research in the field of particle physics. CNR supports and promotes a wide range of research activities across Italy. Both organisations are associated with the Italian Ministry of Education, Universities and Research.